Established in 1991 with funding from the International Capital Market Association (ICMA), the Centre is housed in a purpose built modernist building with excellent facilities for our students. Our dealing rooms are an integral part of ICMA Centre, and the Centre was the first business school in Europe to have a dealing room facility of its kind and is still the only university with a facility on such a scale. Our three dealing rooms, supported by Thomson Reuters and Bloomberg, have always been an integral part of our teaching and learning style – our technology and facilities allow students to put theory into practice. As part of their coursework they experience the thrill and pressures of a live market – take positions, quote two-way prices and manage the risk of a $50-100 million trading book. Students also manage multi-asset portfolio’s using live prices and the latest investment management technology. Having these essential practical skills in today’s competitive and uncertain environment gives our students the edge over more traditional finance degrees. We have over 100 terminals in three dealing rooms equipped with Thomson Reuters Eikon and Bloomberg. The ICMA Centre has the most extensive non-investment bank dealing room facilities in the world. So much so, that regular trading days are held in our dealing rooms for graduate trainees and other personnel of all the major investment banks. Our 40 station flagship dealing room is equipped with all the latest trading technology giving it the feel of a real trading floor. It has a state-of the-art 37 feet 8 colour Daktronics ticker displaying up to date market prices, four plasma screens with the latest news and quotes, and a custom teaching desk with Crestron 10” touch control screen. These rooms are not merely training centres for traders of the future; but they also enable academic staff to combine theory and practice across a whole range of activities, whether in derivatives trading, portfolio management, risk management, financial engineering or corporate finance. Our dealing rooms are equipped with 90 Thomson Reuters and 20 Bloomberg Terminals. As part of our practice-centred teaching and learning approach, our students utilise the information available through these terminals in order to work on projects that aim to build their financial analysis skills and improve their market awareness. The tools available through such financial databases are also employed in the classroom to enhance the learning experience as part of a teaching approach adapted to the needs of the competitive financial marketplace. The dealing rooms are also equipped with the most widely used programming software such as SAS, SQL, VBA, Python, R, among others. 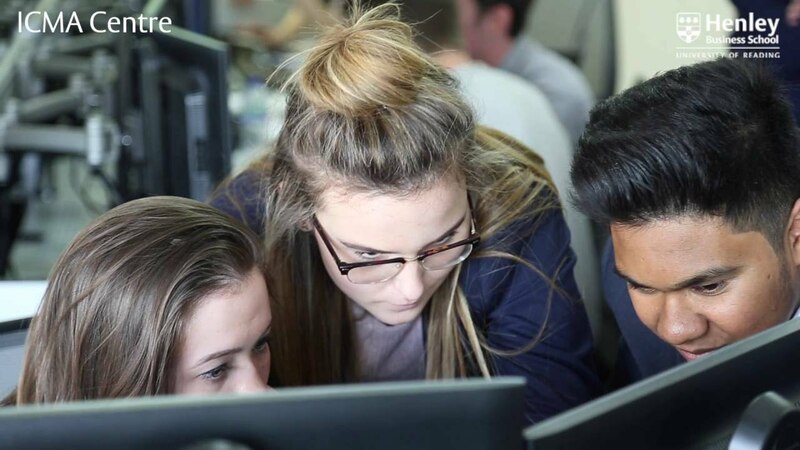 Since programming is becoming an increasingly important skill for finance graduates we have developed courses and modules that focus specifically on programming for finance. Our other facilities include two conference standard lecture theatres fitted with the latest AV equipment, seminar rooms, dedicated research area, café bars and Bloomberg TV. The ICMA Centre’s ICTrader, developed in partnership with 7city, is one of the most sophisticated trading simulations available in the market. With a wealth of trader performance statistics to back up the high intensity dealing, traders really feel as though they are actually on a trading desk. Covering a range of markets from spot foreign exchange to single stock multiple strike equity options, ICTrader allows you to truly immerse yourself in the world of dealing. ICTrader is a dealership market where traders act as market makers both to other simulated sell-side market makers and to buy-side clients. The simulation is news driven and traders are required to manage the risk of their trading book using a variety of risk management tools ranging from basic to highly sophisticated. ICTrader also incorporates a peer to peer OTC trade settlement facility. ICTrader currently covers trading in cash equities, spot foreign exchange and equity options. Under development are index futures, commodities and fixed income markets. The ICTrader scenario writer can be used to create trading scenarios in almost any market or currency. It is a very user friendly yet extremely powerful and flexible tool and allows the user to tailor-make a multitude of global market situations. A recent example is a trading scenario created for the Qatar equity market involving simulated Qatari brokers and clients and using actual Qatari and GCC news flows. The ICTrader dealing report incorporates a very rich set of statistics and measures which are used to evaluate trading performance. These include trading activity in both the market maker and client markets, dealing profit relative to the average market profit, ratio of winning trades to losing trades, a variety of limit breaks, the average size of trades and percentage of client orders filled. Each individual trader’s report can be seen by the administrator at any time during the trading session allowing for continuous trading analysis and feedback. My experience at the Centre was one of the best moves I made in my career…. It has been the most rewarding and valuable experience of my life.